My sweet friend Nia, had a Margeret Sherry Lovers Blog. She organizes al kinds of great exchanges. For Easter I thought I will try and enter as well. But still my partner didn't let know if she send something too me. On that blog there is a rule. "Nobody will stay's with empty hands"
So Nia asked if there where girls who wanted to send me pixie gifts ( so does they call them). Ow my, what beautifull packages did I got. She send me a beautifull white hearts shape card holder. Made 2 beautifull cards, with cute patterns of Margaret Sherry, one stitched and one of paper. Then cute heart stickers, that I love so much, she used them with the mouse, the inside heart you can fold open. Valérie makes the most beautifull needle-books. But as a suprise she made me one now. I'm in love with that name, we use it all the time. I use it every day that cute cute needle-book. 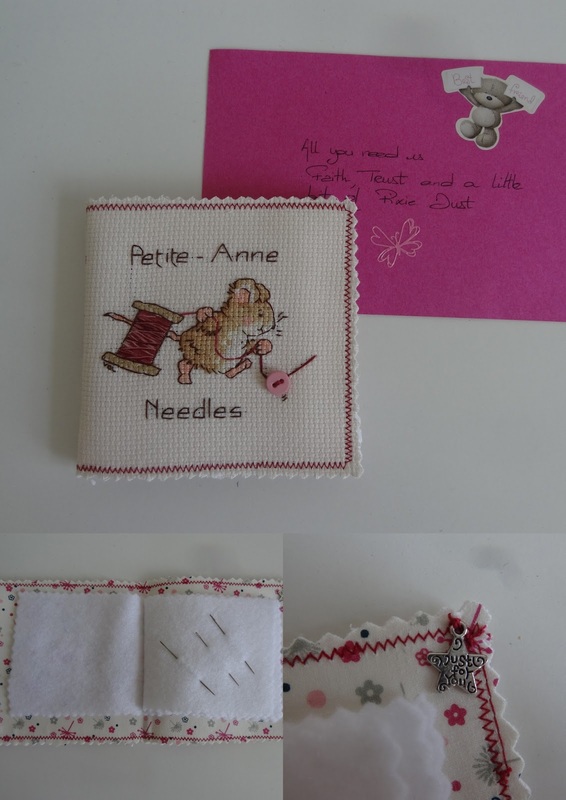 And for the first time I don't loose my needles anymore..
Then came a package from Canada (I;m right Anne?) from Anne. She made me a cute cat hanger and put some lavender with it.. It's smells still so great. And I'm not done yet. Another package come, also from the Netherlands, from Olga. Begin with the lovely bag she made me, with ladysbugs on it. She put a lot of chocolate Easter eggs in it, and she wrote I can use it as a trashcan. How handy is that !! Blue felt, with lovely stitching thread. And a spin of lace. Dear Olga, thank you so much for this lovely pixie dust. Sunday was my last day off work. I'm having 3 WEEKS VACATION. So sweet Ingrid send me a happy vacation package. Put great ballons in there for the kids, for me a pattern from HuisVolKleur, she knows I love so much. 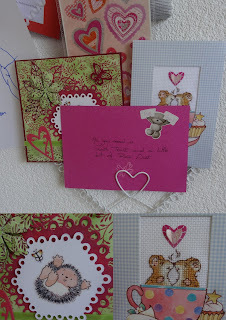 And her mother made the beautifull ladybug card. My vacation is starting great!! We have summer weather about 20 degrees, but the next few days will not be that great, a lot of rain they said. Hoping the rest of the vacation we have good weather.. Playing with the kids, working and sitting in the garden. You have the best stitching friends ever! What wonderful gifts from all those Margaret Sherry lovers. Enjoy your goodies and your time off! Heerlijk verwend ben je Annette, geniet van al de mooie spulletjes die je mocht ontvangen. Wow, what wonderful people came to the rescue!!! What a great group of pixie gifts, Annette--no one wanted you to be left out :) I'll bet you'll love having all the time off to spend with the kids and your crafts--enjoy! !